These monkeys (Cercopithecus aethiops sabaeus) were imported to the Eastern Caribbean by Europeans who wanted them as pets. 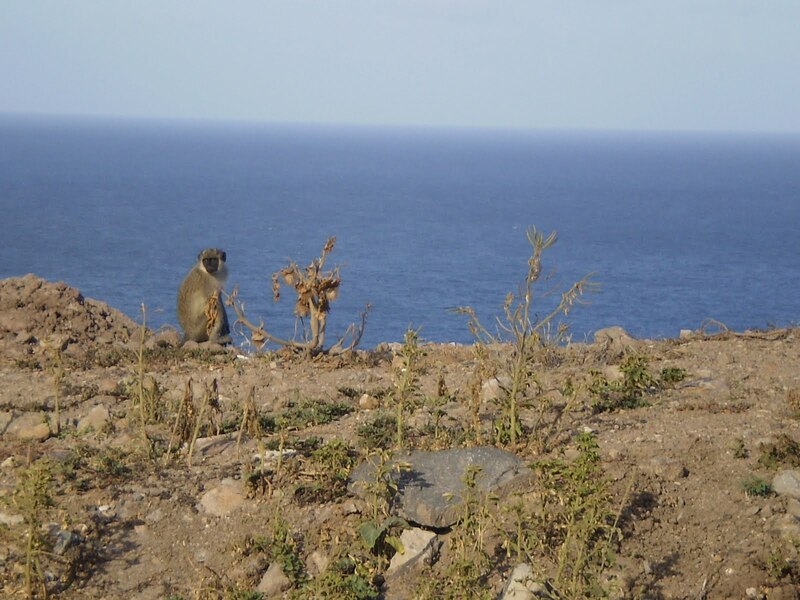 Due to their release, they are now part of the wildlife in St. Kitts and Nevis. They have many common names including savanna monkey, singe vert monkey, green monkey, and more. They are native to Western Africa and their habitat varies widely. In the West Indies, they hang around densely populated areas and farms. They do this because of the opportunities to steal food. Many farmers' crops have been destroyed by these monkeys. Vervets, like chimpanzees and babboons, are very much omnivores. They do prefer manoges and other fruit, but a good part of their diet is insects and rodents. They usually feed, sleep, and travel in groups. They are really small, wieghing between 9 and 17 pounds. Since the vervets are non-endangered, get high blood pressure, and more, they are commonly used for biomedical research. Being that they are not from St. Kitts and Nevis, the islands are allowed to capture and sell them to American reasearch companies for a decent bounty. They have been known to eat monkey in the West Indies in times past. 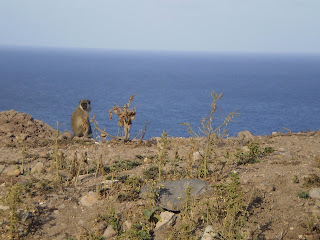 It is said that the number of monkeys in St. Kitts and Nevis is double that of people... and they DO steal your beer. good info. who knew they were little drunks! interesting about the research my students wil be debating the use of animals in labs on friday but in español. I suppose I will be in the minority when I say I do not agree with animal experimentation. Apart from the obvious cruelty issues, monkeys and other animals are not human beings. Surely this tells us the effects on monkeys etc will be different from the effects on human beings. I do realise that many life saving drugs have been brought about due to animal experimentation but I have to say in all honesty it never rests easy with me. I am also a vegetarian....perhaps that explains even more. It's an interesting topic in the very least, but in Spanish?!?! Holy cow! They really are drunkards though. lol. You really aren't in the minority. Years ago (when I was in middle school) we started a program to rescue lab animals and adopt them out. Not the monkeys, of course, but the rats and guineas. Unfortunately, many primates react the exact same way as humans due to certain things and if we tested on humans there would be so much liability. Many primates have physiology that is almost exact to humans so it's a decent alternative. It's one of the catch-22s that biologists have to face. We live in a sue-happy society. I don't like using animals for testing. I used to have a really hard time collecting them for dissection and preservation. In the end, I got a little used to the curation part of it. I still don't like the testing. When I first read the title, I thought it was Velvet Monkeys!! As in plush toys. LOL. Monkeys get high blood pressure??? Never would have thought of that. I don't like testing on anything either, but I do understand the need for research. I'd just hate to be the animal handler. I almost forgot - you collect wizards too? Awesome! I love magicians, wizards, anything like that. Will send you a pic of a magician. It's Visionary art by Gilbert Williams. I do collect wizards and I LOVE these pictures! Awesome! How many wizards do you have? I have 2 only, 1 poster and some pics. The first pic I sent you was by Gilbert Williams. If you don't know of him, just google his name and you will see his pics. They are awesome. The second wizard I just googled one day. Don't remember where he came from.